It's been very cold here this past week, but not a single snowflake! We're in the mood for several of our family's favorite comfort foods. I'm keeping those in mind while I plan for this next week. We had some unexpected leftovers from my son and his friends last Sunday evening, that changed our menu last week just slightly. The group comes over to our house on Sunday evenings, for dinner and games. They cook together, and often leave a share of the ingredients. Last Sunday, they made tacos and left guacamole, salsa, sour cream, taco shells, cheese, lettuce, tomatoes and flour tortillas. Woohoo! We're having tacos for dinner! Having been gifted with all this yummy food, I needed to rework a part of last week's menu. Tuesday seemed to be the best day to fit in tacos. Tuesday's plan had been French dips, saving some of the beef for Friday's soup. So we pushed the French dip and vegetable-beef soup to this coming week. And last Friday's soup became lentil-vegetable. Otherwise, the week went smoothly. In fact, Thursday was one of those days that I dread, really, really dread. And having a plan for dinner actually helped me to relax through all the driving around, appointments, classes and work. I knew in advance that Thursday would be a jam-packed day of me driving around town, working, daughters to dance, school and orthodontist (at far ends of town), and dinner would have to be practically ready to eat when I walked in the door in the evening. Having it all thought out and planned to use leftover ingredients from less-busy, full-cooking days, made the dinner prep aspect of my day a breeze. Having kids help each a separate night, really simplifies my work. While I was running around town, my son peeled and chopped the carrots for oven-roasted veggies for me. It might not seem like a lot, but it meant that when I came home, I could pop the tray into the oven while I stirred up the ham and spinach in mushroom sauce for the toast. Busy-day cooking, simplified. For leftovers that I have planned a use for later in the week, I've begun putting those items in the garage fridge, with a sharpie note saying when I plan on using it. Out of sight, out of mind. It's frustrating to think I have everything all ready for a dinner later in the week, only to discover that something's been eaten. I may be buying foods that I wouldn't have thought to buy, like the 2.5 lbs of mushrooms. They were delicious! But if I was just planning the day before or the day of, I likely would not have bought those. But again, they were delicious! And I think it's okay to have a splurge on an everyday night. Thursday is the busy day this week, so I've planned the easiest to throw together dinner for that day. I'll be using all leftovers, or ingredients prepared in advance for the hash. All I'll be doing is tossing it around in a skillet for 10 minutes, to heat through. My kids will be making a soup, mostly from scratch, plus cornbread and rhubarb sauce on Friday, giving me additional time to finish up projects for the day. Sunday dinner is a rushed meal this week, so it will be a make-your-own affair. 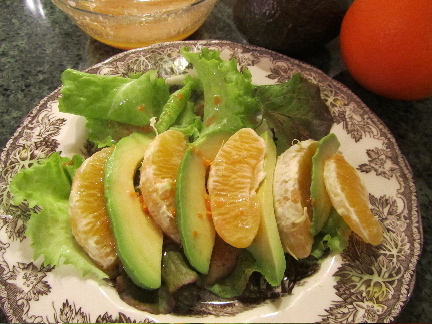 Arrange lettuce, avocados and orange segments on individual plates. Drizzle with a sweet and tangy dressing. Here are two options. How have you incorporated the foods you're trying to use up, in dinners lately? I like idea of combining oranges and avocados in a salad. Maybe I'll try it this week if I go to the store again to get an avocado. I've been getting great deals on avocados this month. A couple of weeks ago they were 69c ea, and yesterday they were 50c ea. Do you find avocados on sale in January, as well, in your area? I sometimes wonder how regional these things are. If you like something a bit more tart, grapefruit segments and avocado is also a pairing that I like. Avacados are rarely on sale no matter what time of the year it is. Is that so? I was wondering if produce like avocados might follow regional patterns in sales. Ours come from California. Growing up in So. Calif I remember many avocado orchards. My husband lived in a house in Calif for one year, as a child, with avocado trees on the property. He didn't like avocados then, and he regrets it, because they could have all the avocados they wanted that year.